Imagine that you had invented a thingamajig that was widely recognized to be of high quality and very useful. Soon, everyone was buying one and your hard-earned investment was paying off. The, suddenly or slowly, purchases started to drop and the money was only come in dribs and drabs. You’d reached the dreaded saturation point at which everyone who needed your fantastic thingamajig already had one and, since you had created something with such high quality, the only people who ever purchased another were those who had lost it somehow. At this point you have to invent something else that everybody is going to need if you want to continue to make money. If, however, your invented doohickey had in it a joint that weakened and broke after 200 uses or if the outer covering of it could be redesigned to make the old one look so unfashionable as to be embarrassing, why you’d be back in business. The idea of planning for future failure, or engineering need for continuing purchases into a design, is termed planned obsolescence and was popularized as a concept in the 1950s by Brooks Steven. DHL released its latest DHL Trend Report today – 3D Printing and the Future of Supply Chains. DHL has been testing a variety of both 3D printing hardware and techniques for several years and has identified applications that have potential to redefine manufacturing and supply chain strategies. While the 3D printing market is estimated to grow between US$180 billion and US$490 billion by 20251, the report however finds it will not become a substitute for mass-production but a complementary process. DHL, part of Deutsche Post, has just released its newest DHL Trend Report, entitled “3D Printing and the Future of Supply Chains.” The report, while offering an in-depth look at how 3D printing technologies will play a part in manufacturing and supply chain processes, is also a bit of a call down to earth for those toting the revolutionary potentials of additive manufacturing technology. That is, while 3D printing technologies and applications are undeniably growing and advancing, DHL suggests that additive manufacturing will not fully replace existing manufacturing methods (especially for mass production) but will be used more as a complementary process. DHL, which has been working with 3D printing for years and has initiated pop-up 3D printing shops, has stated in its latest report that despite a projected growth to $180 billion to $490 billion by 2025, the 3D printing market will remain a complementary manufacturing process, used primarily for producing customized and small-batch complex parts rather than being adopted for mass manufacturing. 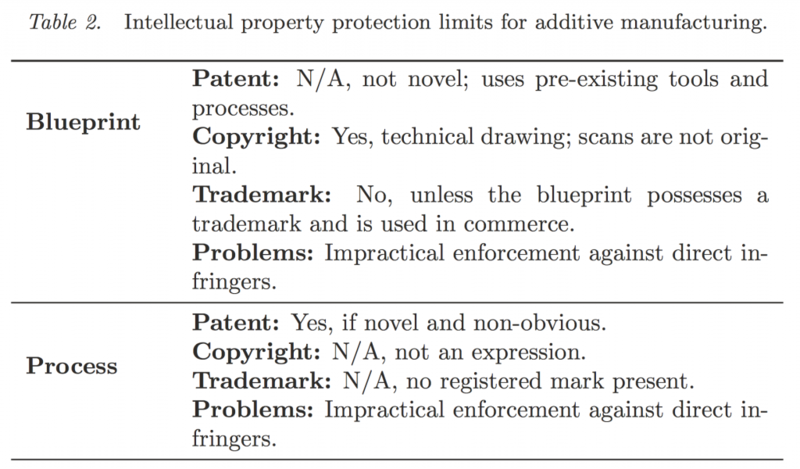 Should IP owners be afraid of 3D printing? When a new manufacturing method like 3D printing becomes widely commercially viable, it breaks down barriers to market entry for thousands, if not millions of companies. TCT’s pages are full of stories of businesses that owe their success to semi- or fully automated additive manufacturing (AM). Innovative companies enjoy reduced costs for shipment of their creations to markets far and wide. Many other players also use AM to operate on the back of others’ creations. Websites allowing sharing of CAD designs of physical objects are particularly popular, giving individuals or companies that already have access to AM devices all they need to “print” their own copies of others’ products and creations. Sharing CAD files and creating associated objects in this manner can of course allow private individuals to enjoy hobbies harmlessly, and can even spark creativity in those willing to invest time in creating their own designs. Author Supercharg3dPosted on 24th November 2016 30th March 2017 Categories Wider ImplicationsTags IPLeave a comment on Should IP owners be afraid of 3D printing? 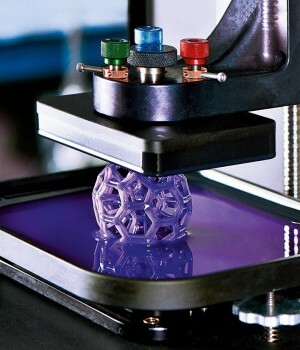 3-D printing (3DP) is the process of making physical objects from a digital model using a printer. Although still in the developmental stages, the technology has advanced swiftly since its introduction in the 1980s, and is already presenting opportunities in new areas, such as in the custom manufacture of prosthetics, dental products and other medical devices or high strength lightweight precision automotive and aerospace parts that would have been unimaginable just a few years ago. Over the next decade, technology observers predict that the pace of change will intensify and more and more applications will be found as sophistication increases and the cost of equipment falls, following the now well-established curve for technology products. Even though 3D printing has been around for a while, it has struggled to move past its reputation as a high-priced toy for techies. UPS, along with partners SAP and Fast Radius, a Georgia-based manufacturer, have launched an effort to bring 3D printing full steam into the world of scaled industrial production. Instead of producing a single trinket or a custom iPhone case on a per-unit basis, the partners have teamed up to print everything from auto parts to medical devices. All of this is done at scale with production runs numbering in the hundreds of units. 3D printing has captured the imaginations of engineers, researchers and manufacturers in ways that no other advanced manufacturing technique has done previously. In simple terms, a 3D printer can turn digital representation of an object into a physical object. Users of 3D printers can download digital 3D model files that can allow a 3 dimensional object to be printed. These 3D model files can be derived from existing objects by way of a 3D scan or they can be created independently of any real object through traditional Computer-aided design (CAD) techniques. 3D printing’s promise in terms of a rapid, sophisticated and cutting edge manufacturing technique is unequalled in the field of materials science and manufacturing. 3D printing will usher into the marketplace the next digital disruption, that of digital manufacturing and construction, a disruption that is undeniably gaining momentum. 3D printing service portal 3YOURMIND have announced a partnership with Dynamic Parcel Distribution in a bid to simplify the overall supply chain. The collaboration is the latest of a trend in which logistic companies are integrating 3D printing into their everyday operations. As additive manufacturing has matured, its uses have expanded to the production floor. The software and hardware combinations make it possible to design a product and 3D print in a variety of materials with high resolution. In terms of cost, additive manufacturing has already dropped below traditional production methods at low volume outputs. A shift that looks likely to continue. As more businesses and individuals now own 3D printers, the transfer of goods is beginning to take place more in the digital space and less in the physical, meaning logistics companies need to alter the way they do business. DPD will leverage their wide-ranging delivery services to help 3YOURMIND meet the needs of customers, but both companies share a vision of 3D printing as a mobile service as well.